Sano di Pietro’s Adoration of the Child is a painting with more gold on its surface than paint (Figure 1). Created in mid-to-late 15th century Siena, the work both expresses the particular love of Sienese patrons for gilding and demonstrates the particular talent of Sienese painters for manipulating gold into resplendent patterns. Adoration of the Child is part of the Samuel H. Kress Collection of the Mead Art Museum at Amherst College, Massachusetts. In September, 2014, it arrived at the Institute of Fine Arts Conservation Center for examination and treatment. 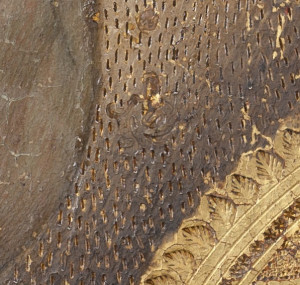 Looking closely at the painting provides insights into how the gilt decorations were applied, the different decorative techniques, and the character of their application. 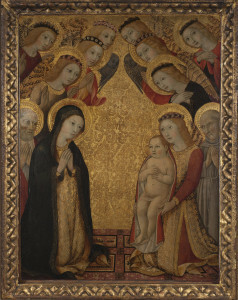 The procedure used to gild the Adoration of the Child follows the basic sequence described by the fifteenth-century painter Cennino Cennini in the Craftsman’s Handbook. The wood panel was prepared by applying a ground layer, smoothing the ground layer, applying a layer of red clay known as “bole,” and laying down squares of gold leaf. 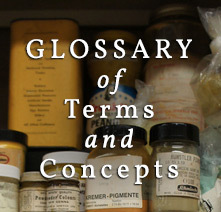 A video of the process made by the Getty Museum can be seen here. (https://www.youtube.com/watch?v=WVyusmjiTXI&index=6&list=PLB6DE52794450CD9B). The gilt decoration in the Adoration of the Child follows this sequence. Freehand incised lines—likely guided by a drawing—outline the design of the brocaded background, while compass-drawn incised lines encircle the haloes. Stamped motifs from over ten different punches accentuate and reinforce the incised forms. Some stamps stand alone as independent decorative units and others work in tandem with other motifs to form larger ornamental complexes. Stippled texture glitters on the background brocade and haloes. Next, a second decorative technique—known as sgraffito—was used to pattern the wings and garments of the saints and angels. 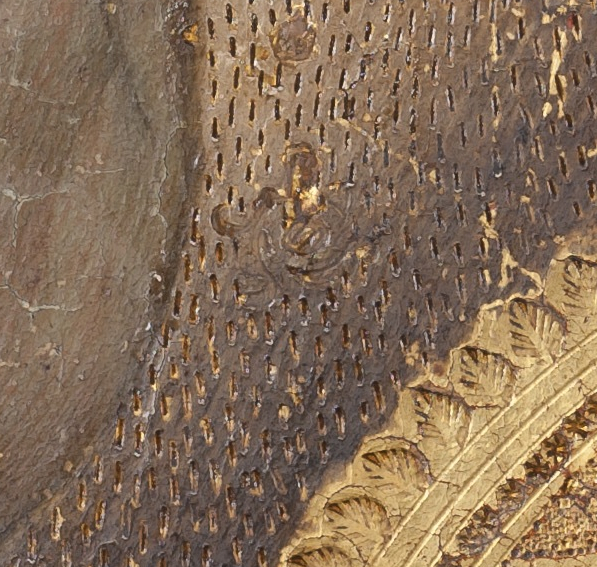 Here, a layer of paint was applied over the gilding and subsequently removed with a stylus to reveal the gold beneath. Simple repeated lines, resembling golden threads, decorate several angelic garments. More elaborate patterns, likely transferred from a drawing, decorate the garments of the Madonna, the Christ Child, and the angel presenting the Christ Child. Within this rigid, systematic framework, the gilt decorations of the Adoration of the Child show surprising idiosyncracies. 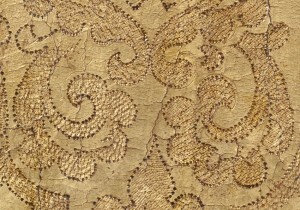 Random variations appear in the background brocade pattern. 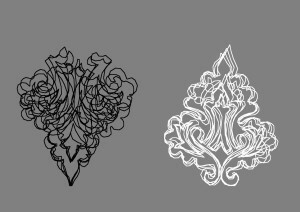 Though the essential structure—a series of floral ornaments running upwards interlocked with a series of floral ornaments running downwards—remains constant, the ornament interiors fluctuate. Some have extra decorative ovals or leaf-shapes, others do not (Figure 2). No logic appears to guide these variations. Figure 2: Photoshop-manipulated detail showing variations to brocade pattern. The grey-outlined shape has additional decorative ovals, the black-outlined shapes have additional decorative leaves, the white-outlined shape has no additional decorative elements. The ornament perimeters also fluctuate. Each shares the same rough shape and tilt, but each has an individual silhouette. Superimposed tracings of the ornament illustrate how none align perfectly with their fellows (Figure 3). Figure 3: Tracings of four downward-running floral ornaments and four upward-running floral ornaments superimposed to illustrate the fluctuation of their perimeters. The character of the tooling itself is similarly freeform and inexact. The incised lines that outline the background brocade appear confidently and quickly applied, often forming energetic semicircles and gestural arcs. Circular punchwork reinforces these lines, but only loosely follows their design, occasionally altering proportions or shifting features. 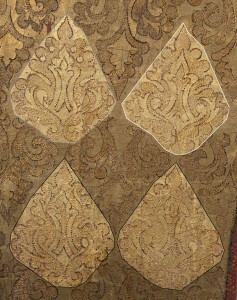 Small stippled punchwork applied to the interior of the brocade does not always fill the ornamental forms completely; often the stippling appears only partially finished (Figure 4). 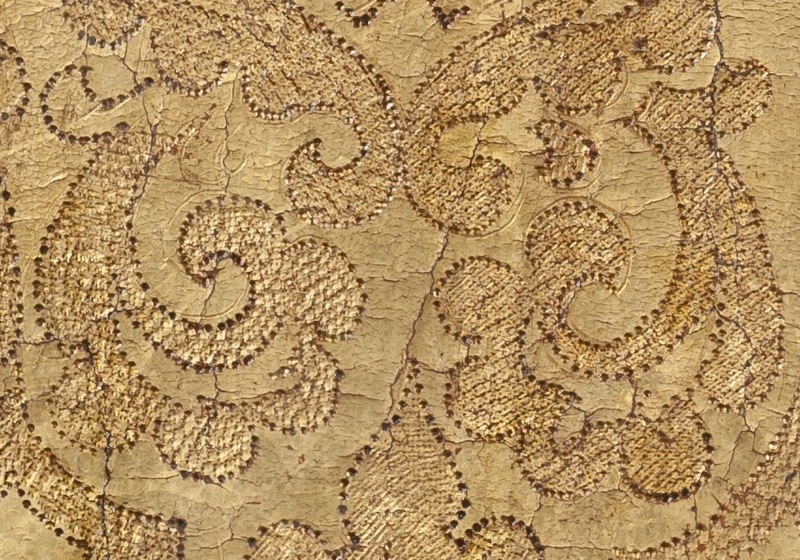 Figure 4: Detail of brocade showing freeform character of incised lines, loose correspondence between punchwork and lines, and partially finished stippling of ornamental forms (upper left corner). Edits, made in the course of painting, can be seen on the sgraffito tooling of the garment worn by the angel above the Madonna. Amongst the repeated vertical lines, a single piece of elaborate ornament appears (Figure 5). 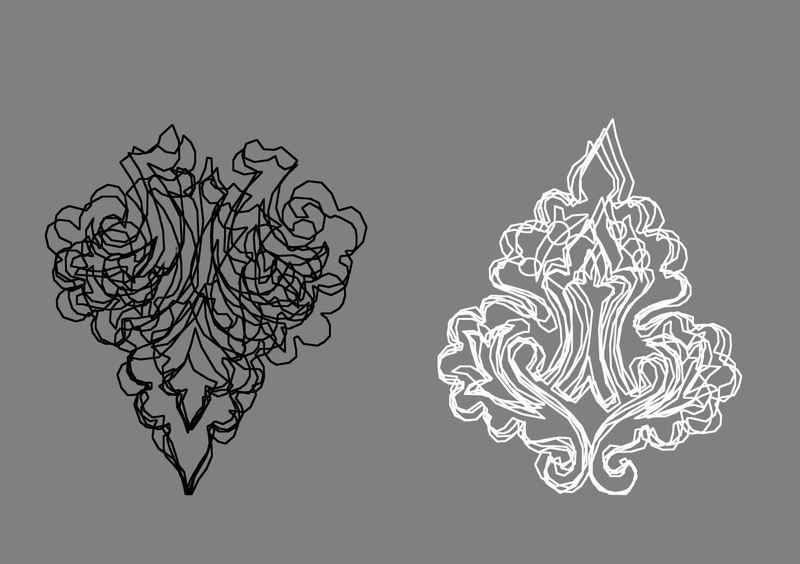 Possibly the misplaced ornament was the error of a workshop assistant; possibly an initial complex pattern was rejected in favor of a simpler linear pattern. Figure 5: Detail of the misplaced ornament on the garment of the angel above the Madonna. Random variations, fluctuating shapes, and possible errors lend the gilt decorations in the Adoration of the Child a loose, expressive character. Such lack of fastidiousness suggests the painting was not intended for scrutinous study. It seems instead intended to dazzle, a showpiece perhaps mounted at a slight distance from the viewer and lit with flickering candles. In a harmonious twist, our twenty-first century scrutiny allows us to appreciate these Quattrocento intentions. [i] Erling S. Skaug, Punch Marks from Giotto to Fra Angelico: attribution, chronology and workshop relationships in Tuscan panel painting; with particular consideration to Florence, c. 1330-1430. (Oslo: IIC-Nordic Group, Norwegian Section, 1994): 63. Cennino Cennini, The Book of the Art of Cennino Cennini: a contemporary practical treatise on Quattrocento painting trans. Christina J. Herringham. (London: George Allen, Ruskin House, 1922): 115-116.